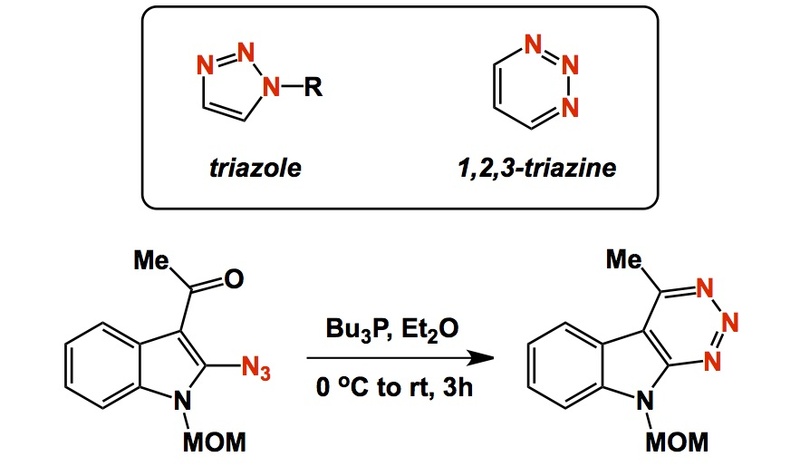 I think we all know about the significance of triazoles, which are readily accessible via [3+2] dipolar cycloaddition between organic azides and variously substituted alkynes. These aromatic heterocycles have found a myriad of applications, immortalized in what we now know as the click chemistry. Are there any 6-membered analogs derived from azides? This is the question I asked myself earlier today. These molecules would correspond to 1,2,3-triazines. As it turns out, there is a pretty nice method by which organic azides produce this sort of heterocycle. Below you see an example that involves triphenylphosphine that acts upon the molecule of an azido ketone. The role of triphenylphosphine in this Staudinger-like reaction is to “mop up” an oxygen atom that is produced upon attack of the terminal azide nitrogen at the carbonyl carbon. In this process, the organic azide acts as a nucleophile. The other notable case where an azide partakes in a polar mechanism is the so-called Aube-Schmidt process, although two nitrogen atoms are ultimately extruded as gas in that sequence. In the triazine case below, all nitrogen atoms stay put. It is not easy to see a concerted cycloaddition reaction that would deliver a 1,2,3-triazine from the corresponding azide, which is why I really like the condensation route shown. This is awesome, these nitrogen-rich 6-membered heterocycles have strong pi-pi interactions with tyrosine sidechains in protein active sites; the charge transfer is strongest when electron rich aromatics are paired up with electron poor aromatics, such as nitrocompounds. (But nitro-substituents are undesirable in a drug candidate). I have played little with Staudinger reaction, making trityl imines from alpha-substituted cyclic ketones and TritylN3 +Me3P (for a diastereoselective reductive amination). A curious observation was that combining a bulky azide like TritylN3 with phosphine does not produce TritylN=PMe3 but instead some kind of other adduct forms, which is reasonably stable at room temperature and extrudes N2 only after the addition of a ketone. I guess in my case the adduct was Trityl-N=N-N(-)PMe3(+) or Trityl-N(-)-N=N-PMe3(+) , and it reacted with the ketone via 6-membered transition state, with nitrogen extrusion. So this would be similar to acety azidoindole example above, except that in this case the keto group is fixed in place and cannot reach the nitrogen 1, so it is forced into 8-membered ring transition state and P is happy to grab onto oxygen. I agree with you that the difference maker in the example quoted is the proximity of the ketone functionality which enables the key intermediate to be grabbed.